Gayle Tzemach Lemmon: I didn't understand how special America's 'right of the soil' was until I lived outside the U.S.
Gayle Tzemach Lemmon I didn't understand how special America's 'right of the soil' was until I lived outside the U.S. The right of the soil instills in the U.S. civic system a special kind of responsibility. And the ideas behind it strengthen our foundations. It wasn't until I lived outside America that I understood what it meant to come from it. And just how special the “right of the soil” truly is. Today, as the phrase “birthright citizenship” gets tossed about often in the media and in Washington, it is worth remembering how central to our notion of our nationhood this concept has become. In 2002, I lived in Berlin on a professional fellowship from the Robert Bosch Foundation. Germans I met used to ask me regularly where I was from and I always answered, “America,” without really thinking about it. This did not satisfy my questioners, however. “But where are you really from?’ they would ask, assessing my coloring, convinced I was really “foreign” to the United States, as they defined it. Over time, I learned where their questions headed: To be American, in their view, you had to look as if you had emerged from an episode of “Baywatch.” Your skin had to be pale, your hair blonde. I tried to explain that in the U.S. we didn’t see it that way: Yes, I said, my father came from another country. But I was born American and was American. Period. “It’s about a principle,” I would try to explain. This brought home to me, with blunt force, how fortunate I was to be from a country where you could be from any place and still belong. But my explanations were almost always unsatisfactory. The concept was too unfamiliar. And this brought home to me, with blunt force, how fortunate I was to be from a country where you could be from any place and still belong. At home I had never had to contend with the question of “where I was really from” — which would have been Prince Georges County, Maryland, for the record. Indeed, I didn’t understand. And I still don’t. As Americans born to people born elsewhere, we do not remain “foreigners” but we immediately are part of the idea of the United States. The right of the soil is sacred. It withstands time, this idea that it is not about where you came from, but of what you are capable. Indeed, it is part of what has kept us safe: this refusal to otherize our newcomers, and instead to immediately bind them to us. One nation, indivisible. And, when we don't live up to our principles, we have paths to express ourselves. We can write or vote or speak out or organize to make change. I had never felt so strongly about the right of the soil and its role in making one nation until I saw the isolation and the sense of insecurity it conferred on young people who didn’t enjoy its protections. I had never felt so strongly about the right of the soil and its role in making one nation until I saw the isolation and the sense of insecurity it conferred on young people who didn’t enjoy its protections, who did not live under its umbrella. And I had never understood so strongly why the principles underpinning the U.S. Constitution and its 14th Amendment mattered. Young people who feel foreign, even when they have never known anything different, never fit in anywhere. They live in a citizenship purgatory, a nationality no man’s land. As a result, they also don't feel invested in strengthening the national fabric because its blanket of protections and membership have never truly covered them. 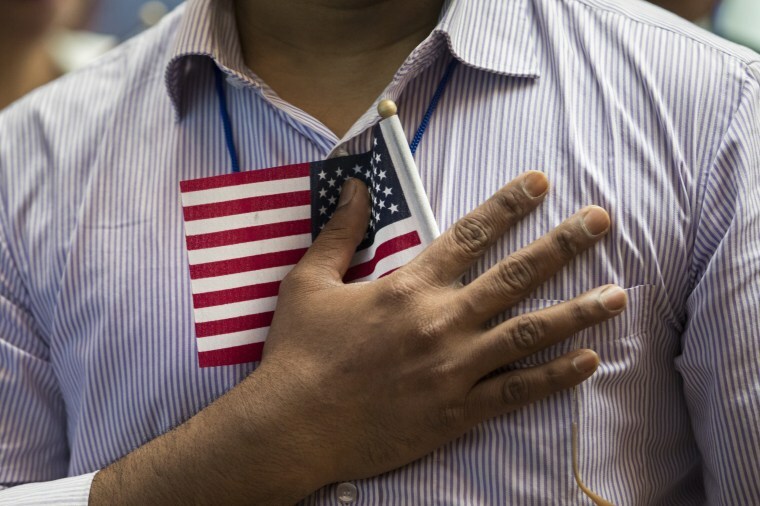 Citizenship and patriotism are connected. We feel fervently about the nations that embrace us. Citizenship and patriotism are connected. We feel fervently about the nations that embrace us. We merge our story with theirs. This allows us to feel part of a greater whole. The right of the soil allows us all to embrace the responsibilities and the rights that spring with the privilege of being defended and protected by the American Constitution. I cannot imagine growing up in a nation that told me I did not officially belong. To be a foreigner in my home. The right of the soil instills in the U.S. civic system a special kind of responsibility. And the ideas behind it strengthen our foundations and add to the “we” that form the “we the people.” I first learned what the right of the soil meant while in Europe. And I feel its power even more strongly while home in America today. Gayle Tzemach Lemmon is an adjunct senior fellow at the Council on Foreign Relations. She is the author of New York Times bestsellers "The Dressmaker of Khair Khana" and "Ashley’s War: The Untold Story of a Team of Women Soldiers on the Special Ops Battlefield."